You can see, I’ve been busy crossing things off my list. 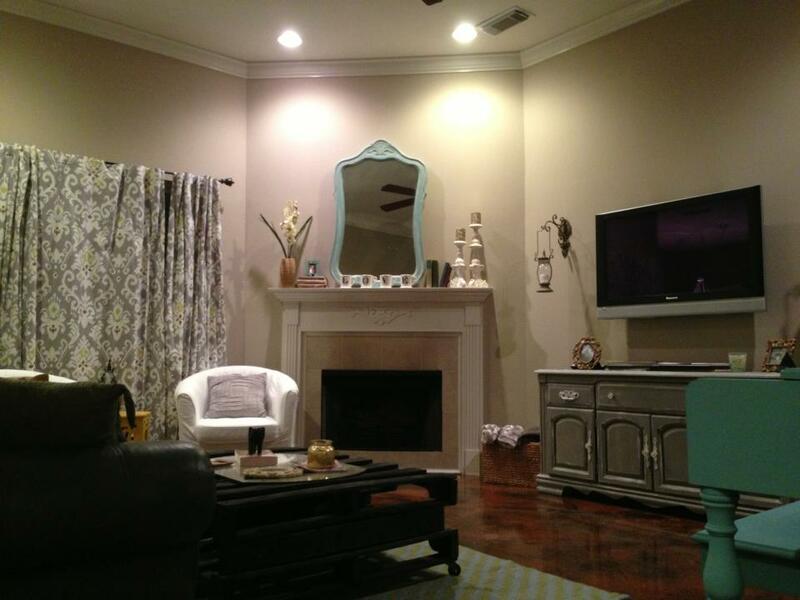 When I purchased my home it was in amazing condition. Really I could have lived in it exactly as it was, but if you know me, you know I just wouldn’t think that was any fun 🙂 I’ve gotten a lot accomplished though! I’m pretty gosh darn proud. With the exception of a few of the above, I’ve done them all myself (big shout out to Amy & Cliff for helping me, too!) There is still more to paint which I will do, but the remainder of things I just have to save up for a while to get done (wood floors, granite, backsplash, fence). Those things are not urgent at all though and will come over the next two years or so! 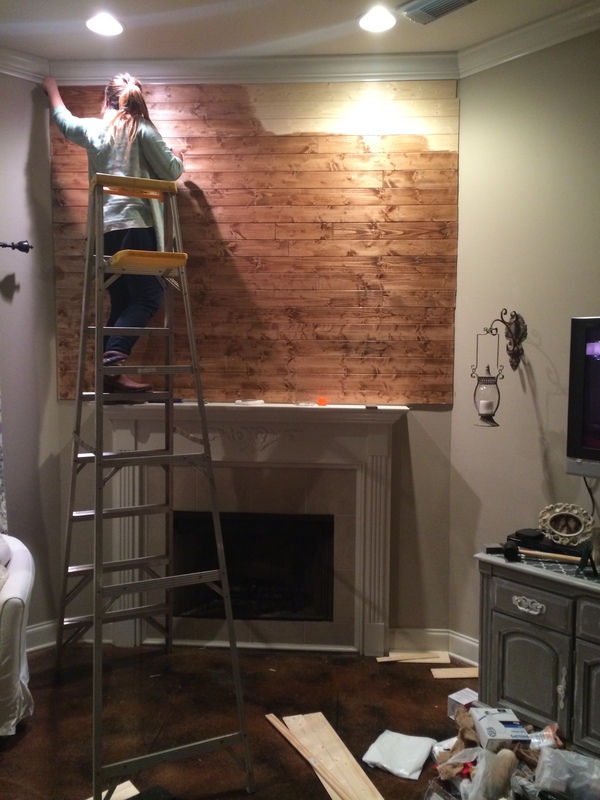 I was really wanting to add some warm wood elements to the living room – so my next up project was the Wood Wall. 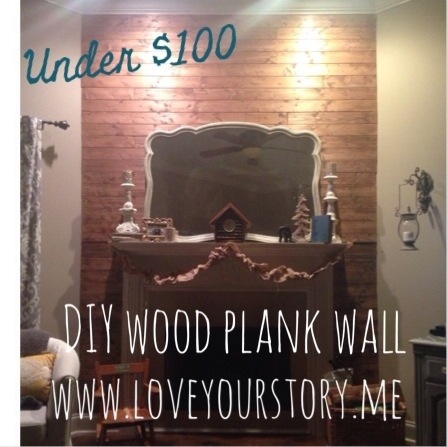 I love the corner wall and felt it was the perfect way to do have a cool accent wall without spending a fortune. 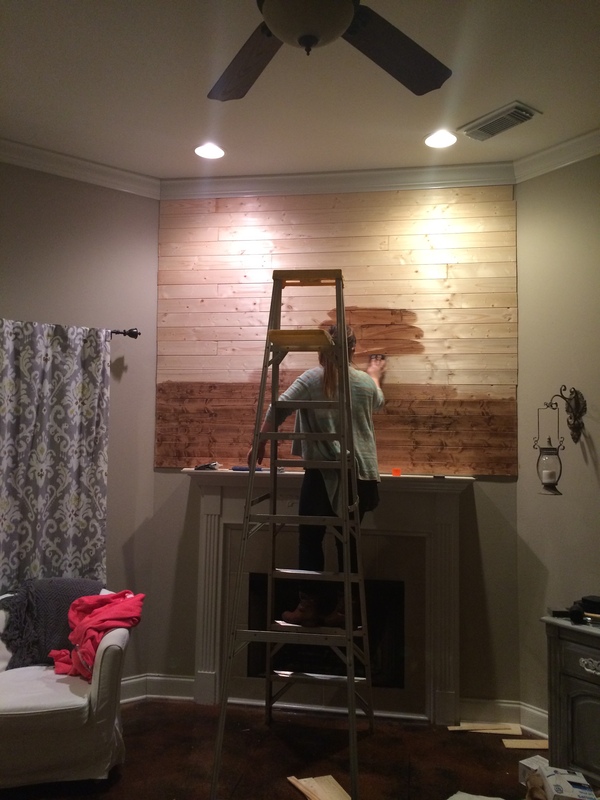 I had planned on going with wood pallets, but the more I researched the more sure I was I just didn’t like the idea of having scrap wood that could have been exposed to so many harmful chemicals/elements prior that I wouldn’t be able to see…..and then nailing those into my sheetrock? No thanks. 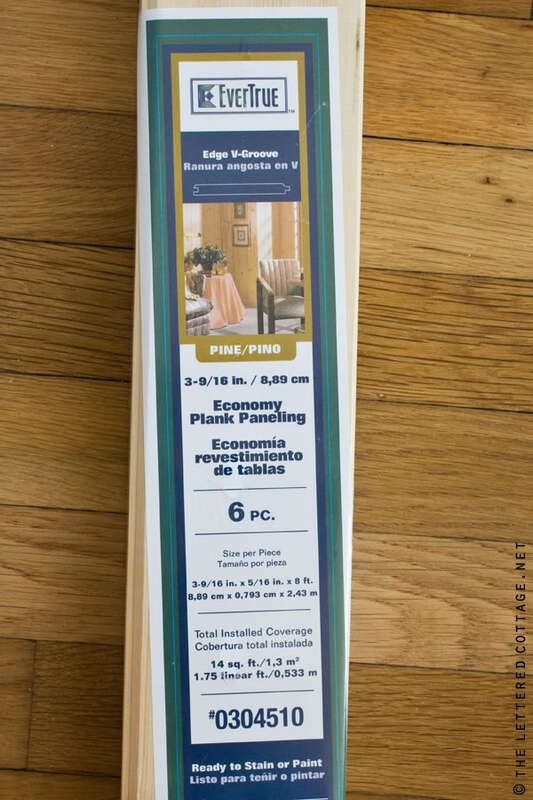 I opted for Evertrue Pine Plank flooring from Home Depot -v groove. They are light, clean, easy to cut, and slip into each other perfectly. They came in packs of 6 with each piece 96inches long. I needed exactly three packs and have a little bit let over. Next up was deciding on what lengths each piece would be for the walls in order to create some kind of inconsistent pattern. 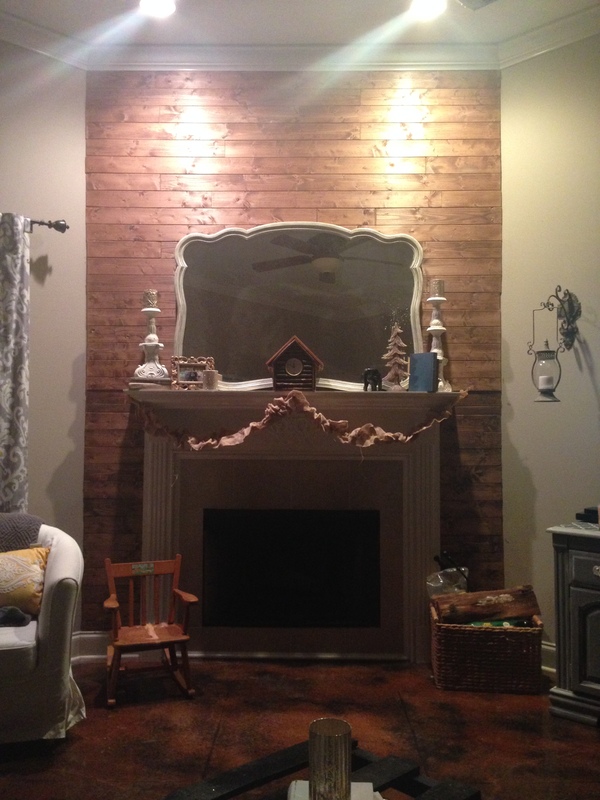 I picked 4 row patterns that I alternated for above the fireplace. With 4 row patterns, which I could flip, I had 8 row patterns in total. I ended up with 16 above the mantle, so it worked rather perfectly. The sides down each side of the mantle on the bottom half had to be cut on site because the wall was not perfectly even all the way down. Prior to this, I didn’t own a saw nor had ever used a saw. 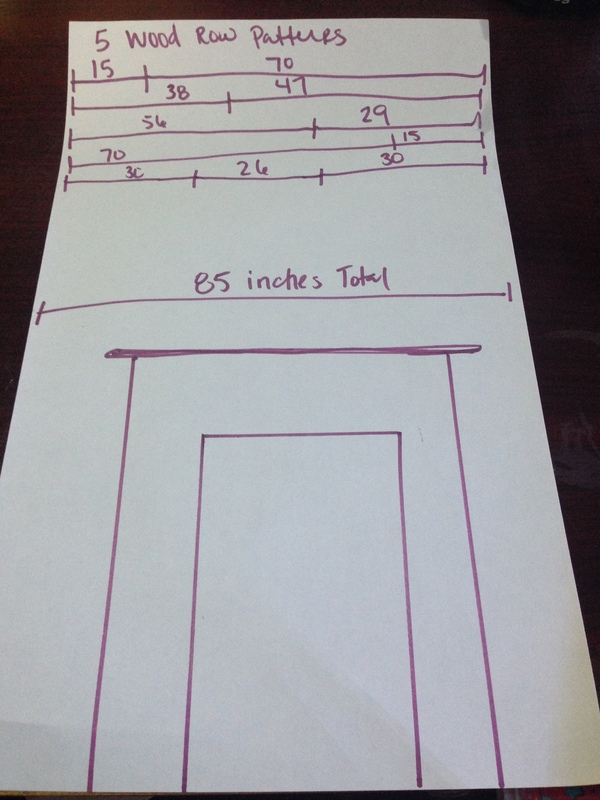 I figured out my measurements and figured out how many rows I needed of each and was able to get Home Depot to do all the cuts for me for above the mantle. They don’t normally do multiple cuts, but due to my detailed planning I figured a way for them to do them all so that they were not doing 100 cuts at one time. 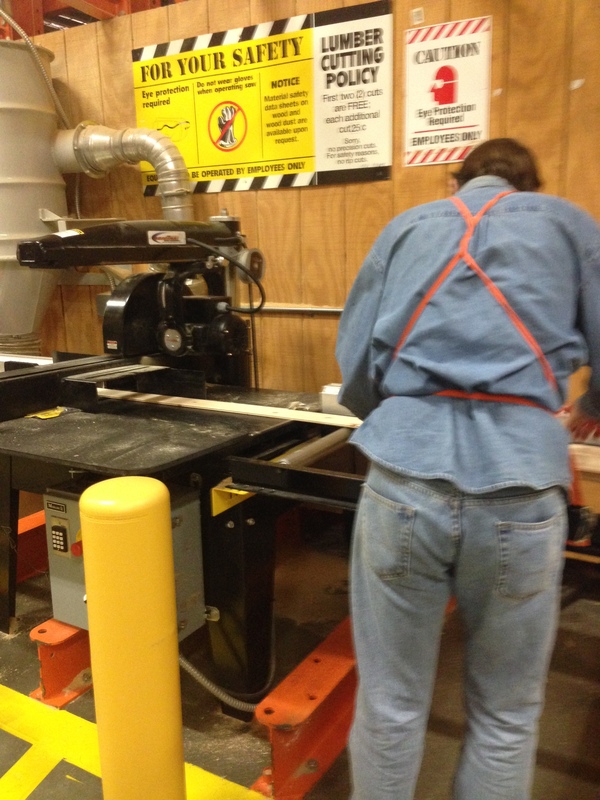 I had them cut all 16 boards to 85 inches first ( in 3 cuts – they stacked the wood in groups of 5 or 6) and I saved the scraps from that cut- then we grouped the rest (4 of the 85 inches boards were cut at 15 inches – 4 were cut at 29 inches & 4 were cut at 25 then again at 30). I ended up only having to get about 5-6 cuts made. I was so thankful they did this it made it so easy when it came time to install. 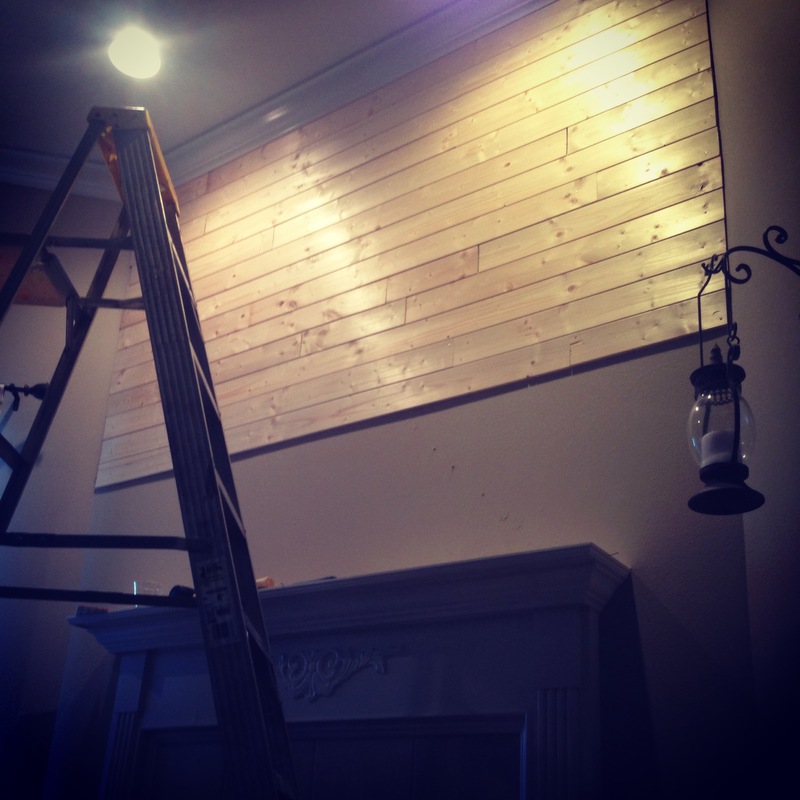 The boards above the mantle went up so easily -just nailed them in and in a few hours that part was done! 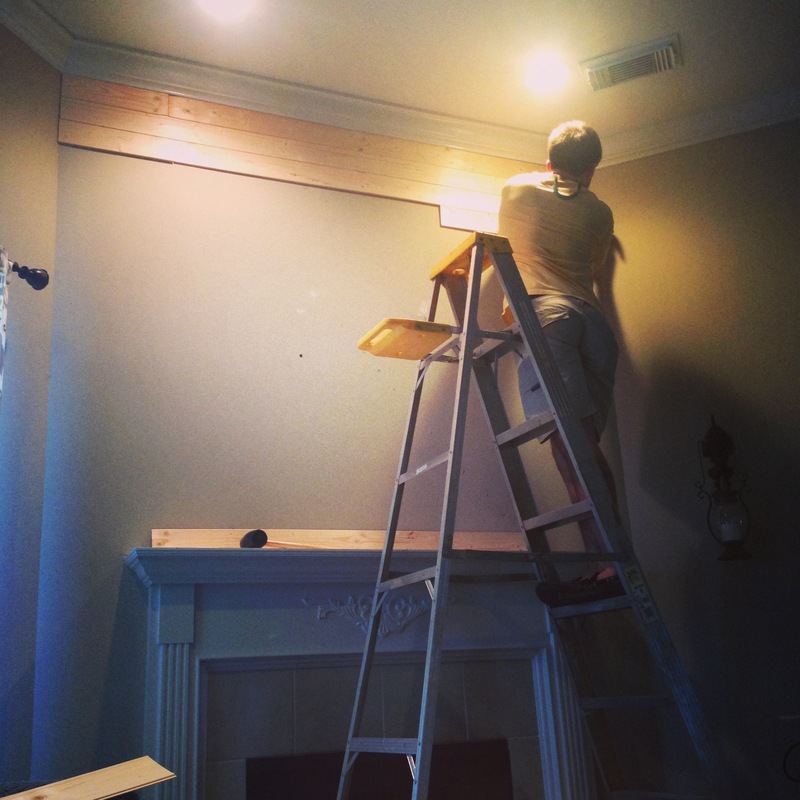 If you have stud finder – mark where the studs are, and draw a line on the wall for nailing them in. Let’s all just take a minute here to say THANK YOU HOME DEPOT IN COVINGTON, LA for working with me! Home Depot has great employees! 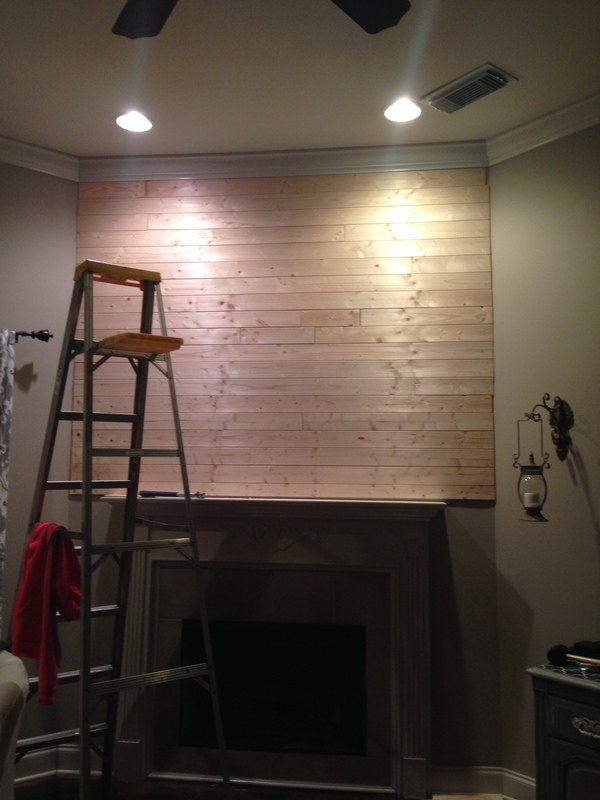 Progress Pic 1 – The wall is going up! Above the mantle is complete! I was too impatient to wait to do the bottom, so I stained the top that night. I used the color Special Walnut. Staining took about 15 minutes in total. Normal people would tape the edges. I live on the wild side and didn’t. That is also why I’m in a cute outfit instead of painting clothes….or maybe that’s because I was too lazy to change? And we’re dunzo for night 1! Took about 2-3 hours in total (prep, assembly, staining) for this section. I looked into a few different ones and just purchased a basic Ryobi jigsaw that happened to be on sale for $30. My next project is setting up a womanized tool station in my garage. I feel like I should name this section of my blog, Girls and Power Tools. Whatcha think? Anyways, night 2 – I just right on in and starting doing individual cuts on the wood floors. Now, I will saw with the jigsaw the edges were not AS SMOOTH as the ones from Home Depot. I’d have preferred to purchase a table saw, but I’ll have to save up for that. This was quick and easy. I just sanded the edges of the boards and used a bit of wood glue if needed to fill in any gaps. Really the distressed look made the wall edges look cooler anyways, so it worked out. If that’s not what you’re going for though, just be prepared to sand a bit more. 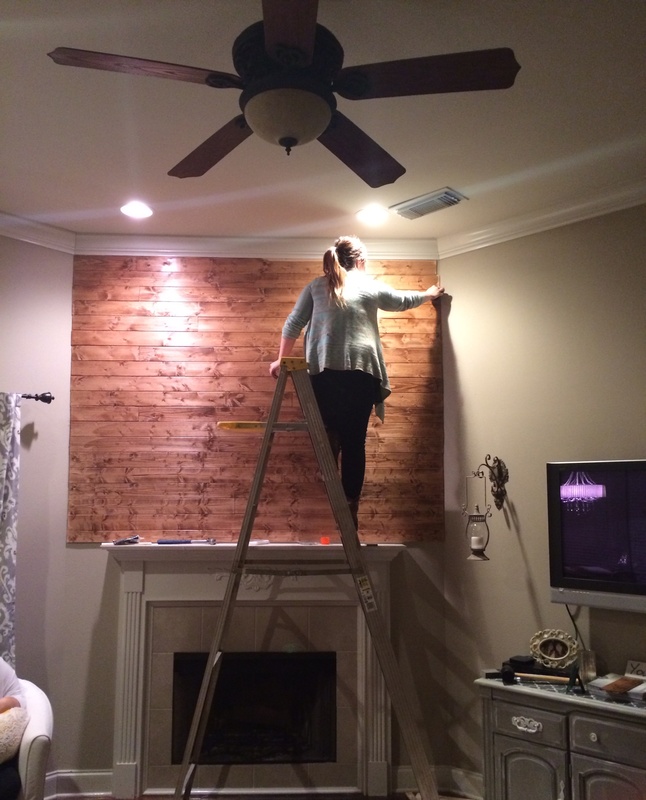 After the custom cuts and nailing them into the wall – it was done!